A very common debate that San Diego 2-4 unit property owners have is whether or not to renovate their property right before selling in order to yield a higher net profit. If you’re thinking of selling your duplex, triplex, or fourplex, you may be better off selling the property in its current condition than investing thousands of dollars in renovations. This may be surprising to you, especially if you feel like your property is in need of numerous repairs. A frequent question we get from clients is whether or not they should invest in improving the property in order to yield a higher profit when they sell. There is never a simple, black and white answer. It’s important that if you choose to do any renovations or improvements, you are mindful of the consequences of doing so. It’s ideal to first consider who the target buyer would be and what renovations are necessary to attract that buyer. Then you can break down what are the costs and what is the potential sales price after renovation? It’s important to focus on net profit, not just sales price. Take the time to understand what the market is demanding and what buyers are out there. Having the end buyer in mind before you start will assist in giving you a strong direction. What is the timeframe to complete specific repairs? Is that timeframe in line with your desired sales date? It’s important to be conservative when projecting timeframes along with repair costs. How logistically feasible are these specific repairs? Sometimes tenants and other factors exist that may make certain renovations challenging or impossible. Is your property more attractive to buyers in its current condition? Some properties are more sought after as a fixer, especially to investor buyers. When properties are renovated, sometimes there is a more limited buyer pool and this can impact net profits. Again, the goal is the net figure, not just a higher sales price. By conducting certain repairs, is there a risk of discovering further problems which will translate into further costs that cannot be recuperated? Sometimes treating certain problems can reveal that other more costly problems exist (i.e. treating termite damage can reveal other issues underneath wood boards and walls). When you discover more problems, you may then be legally responsible for either remedying these problems and/or disclosing these problems to a prospective buyer. Sometimes it’s better to let the buyer make these investigations on their own and determine for themselves if these are issues that need immediate repair. 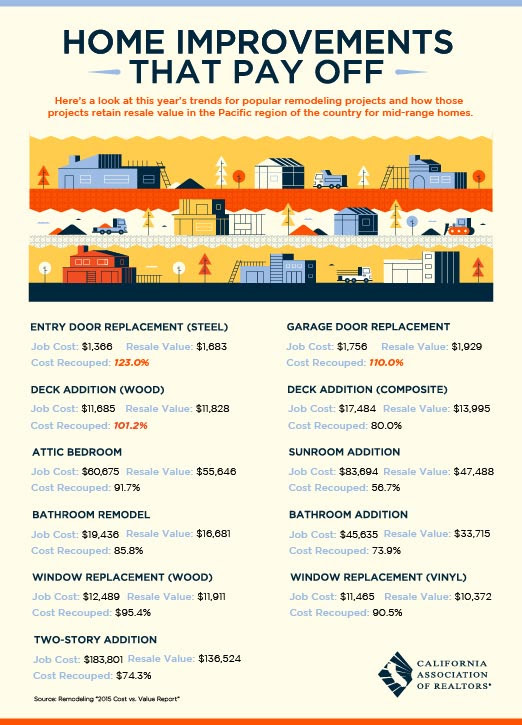 Below is a quick glimpse at returns on investment for renovations for homes in the Pacific region. Although it’s not specifically catered to San Diego 2-4 units, the general principle applies: be mindful of the net value that specific improvements may add. While intuitively it may make sense to renovate a kitchen or bathroom of a unit to yield a higher sales price, that may not translate into a higher net profit. We can help increase your profits! Each property and renovation has to be judged on a case-by-case basis. If you’re thinking about selling and want to know which renovations will yield you the most profitable returns, contact us today!